This article describes the proper procedure for removing vinyl-asbestos floor tiles. We also discuss leaving good-condition vinyl asbestos tile (VAT) in place, cleaning it and treating the surface with a clear coat sealant or flooring restorer/rejuvenator. This document series assists building buyers, owners or occupants in reducing the risk of asbestos exposure from flooring that contains or is suspected to contain asbestos. Is Asbestos-Containing Floor Tile Removal Necessary? IS ASBESTOS FLOORING REMOVAL NECESSARY? We begin by suggesting that you should not remove asbestos-containing floor tile unless it is really necessary. As with asbestos-containing products in general, the asbestos hazard at a building may be greater from disturbing asbestos-containing materials (ACM) than if they were left alone or covered up. But in some cases, particularly during certain building renovations or when asbestos-containing flooring is in poor condition and cannot easily be left in place, removal may be necessary. As we point out at ASBESTOS FLOORING IDENTIFICATION, the US EPA points out in ADEQUATELY WET ASBESTOS GUIDANCE, EPA340/1-90-019 that asbestos-containing floor tiles are considered non-friable materials but the materials can become friable with age or by grinding, sanding, demolition, etc. Flooring that contains asbestos, when intact and in good condition, is generally considered nonfriable and is not hazardous. Heat, water, weathering or aging can weaken flooring to the point where it is considered friable. Friable flooring includes any material containing more than 1 percent asbestos that can be crumbled, pulverized or reduced to powder with hand pressure. This includes previously nonfriable flooring material which has been damaged to the extent that it may be crumbled, pulverized or reduced to powder by hand pressure. Flooring can also be made friable during its removal. Friable materials can release asbestos fibers into the air. Once in the air, asbestos fibers present a health hazard to people who inhale those fibers. See ASBESTOS FLOORING HAZARD REDUCTION for details. Also see ASBESTOS REMOVAL, WETTING GUIDELINES. Non-friable miscellaneous ACM includes floor tiles, asbestos cement sheet (transite board), siding shingles, asphalt roofing shingles, laboratory bench tops and even chalkboards. These materials may become friable with age, and under harsh conditions. Category I non-friable ACM must be carefully examined to determine if the material is in poor condition, that is, if the binding material is losing its integrity, exhibited by peeling, cracking or crumbling; and is also friable. When Category I non-friable ACM has become friable it is subject to the NESHAP. If Category I or II ACM is sanded, ground, cut or abraded it is also covered by the NESHAP. Category II non-friable ACM which is damaged to the extent that it has or will become crumbled, pulverized or reduced to powder due to demolition/ renovation activities, is subject to the Asbestos NESHAP. Miscellaneous materials are wetted in manners similar to those used to wet other categories of RACM. Coverings are saturated with a wetting agent before removal and the asbestos-containing portions fully penetrated with the agent prior to, during and after their removal, while stored in the removal area, and while being placed into disposal containers. Miscellaneous materials that don't absorb water readily (e.g., asbestos-concrete products, and floor tiles) are only required to have wetted surfaces. A misting sprayer may be used to diminish airborne asbestos fiber levels. Leaving old ACM or PACM flooring in place in a building is the first choice approach where that flooring is itself no longer serviceable. Leaving the asbestos-containing flooring material in place will generally be the lowest-risk approach as it is the disturbance (by removal) of asbestos containing material that significantly increases the risk of airborne asbestos in buildings. For and existing tile or sheet floor surface that is intact and smooth, first HEPA vacuum the surface, then if necessary, wash-clean the surface (including wax removal) but only by using a wet stripping / detergent method, not by polishing, grinding, sanding etc (detailed below among prohibitions). RFCI recommends using a liquid dishwashing detergent solution of 16 oz. of detergent to a gallon of water - I suspect this may be far too much detergent and may make soap removal problematic - Ed. (RFCI 2011). Wilson/Snodgrass (2007) warn against using solvents (oil, gasoline, kerosene, lacquer thinner, grease) and also against using solvent-based waxes or paste wax on asphalt-based vinyl flooring because they will soften and damage it. Seal the floor surface? Where sealing the floor surface is desirable the same authors recommend using water-emulsion wax and light buffing (unless the floor is a no-wax product such as produced after 1962). We have also had success using commecial resilient tile floor sealants that are included with floor restoration products and also great success using a combination of epoxy paint and clear topcoats where we wanted to simply install a paint-on walkable surface on an intact asphalt-asbestos or vinyl-asbestos floor. But you will want to test the sealant product on a small discreet area of flooring first to be sure that the chemicals are compatible, as some paint solvents may dissolve or damage some flooring products. Where there are uneven surface areas due to flooring loss, use a pourable or trowel-able floor leveling compound, embossing paste, or material such as Dash Patch™ to level the depressed areas. Where the old flooring is very uneven and in poor condition, such that patching is inappropriate, cover the entire floor area with an underlayment such as hardboard or solid-core plywood approved by the manufacturer of the replacement (new) floor product to be installed. If there are loose floor tiles that interfere with new underlayment installation and that can be simply lifted by hand these material can be disposed of as asbestos waste as we describe in the flooring removal procedure that follows. - treat the material as Presumed Asbestos Containing Material (PACM) or as Asbestos Containing Material (ACM) if that is known. No mechanical disturbance: do not bead-blast, chip, drill, dry-scrape, mechanically chip, pulverize, or saw (or use any other mechanically disruptive method) on any resilient flooring (tile, sheet flooring, underlayments, subflooring), floor backing, felt linings or underlayments, or on (generally black) asphalt-based cutback adhesives or other adhesives (some tan adhesives contained asbestos as well). - adapted from RFCI (2011). Here is the US EPA's general Asbestos Advice for Homeowners, quoting from Asbestos in Your Home, U.S. EPA with minor additions of explanation and adaptation from additional sources. 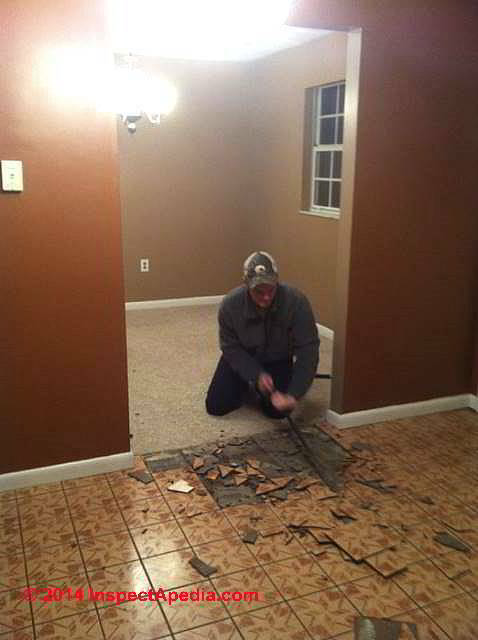 Leave the old flooring in place if at all possible - installing new flooring over-top the old. Removal of PACM or ACM flooring is the last choice in renovation and remodeling work. Do use HEPA-rated vacuum cleaner with a disposable dust bag and metal floor attachment (not a brush attachment) for vacuuming up dust and debris. Do not saw, sand, scrape, sweep, or drill holes in asbestos materials. Don't sand or try to grind-level asbestos flooring or its backing. When asbestos flooring needs replacing, install new floor covering over it, if possible. Do use wet methods for any scraping of adhesives or flooring fragments. Do not ever perform dry scraping or chipping. Never use mechanical chippers to remove ACM or PACM flooring. Do place removed flooring material in heavy-duty (6-mil or thicker) solid plastic bags or into a leakproof container for proper labeling and proper disposal in an authorized landfill - check with your local building department about regulations for the disposal of ACM building or construction waste. Use a detergent solution for cleaning or for separation of wear layer from backer, or backer from subflooring. In the "Leave in Place" section above we discussed using a detergent for cleaning the floor surface. For removing flooring, a stronger concentration of dishwasher detergent may be needed to separate adhered sheet flooring or floor tiles from the backing layer (that can be wet-scraped) or in separating the backing layer from the subflooring below if actual flooring removal is absolutely required. Also see detailed ACM / PACM flooring removal procedures found the RFCI's "Recommended Work Practices for Removal of Resilient Floor Coverings" (2011) found in REFERENCES below or contact the Resilient Floor Covering Institute at www.rfci.com, La Grange GA., Tel: 706-882-3833 for further advice. Removal is usually the most expensive method and, unless required by state or local regulations, should be the last option considered in most situations. This is because removal poses the greatest risk of fiber release. However, removal may be required when remodeling or making major changes to your home that will disturb asbestos material. Also, removal may be called for if asbestos material is damaged extensively and cannot be otherwise repaired. Removal is complex and must be done only by a contractor with special training. Improper removal may actually increase the health risks to you and your family. The University of Minnesota source at REFERENCES at the end of this web page includes more detailed advice on removing asbestos-containing floor tiles if removal is required for any reason, and the UM provides examples of do-it-yourself removal procedures that are safe for homeowners as well as examples that were probably unsafe or improper. Note: while this document is specifically addressed to building owners and contractors in the U.S. state of Oregon, it's advice is clear, simple, easy to follow, and will be helpful for anyone concerned with the need to remove asphalt asbestos or vinyl asbestos flooring or to handle asbestos-suspect floor tiles. This document provides guidance for removing nonfriable vinyl asbestos floor tiles (VAT). If the project is taking place in a school (K-12), you must comply with the Asbestos Hazard Emergency Response Act (AHERA) rules from the U.S. Environmental Protection Agency (EPA). Contact the EPA's regional office at 800-424-4372 for current rule and policy information. Oregon Occupational Safety and Health Administration (OR-OSHA) also has rules for working with asbestos-containing materials. Contact OR-OSHA at 503-378-3272 for current rule and policy information. Vinyl asbestos floor tiles must be removed, handled and disposed of in a manner that keeps the material in predominantly whole pieces to be considered nonfriable. The method of removal cannot shatter (broken into 4 or more pieces), crumble, pulverize, or reduce the material to dust. Sanding, sawing, grinding, chipping, or the use of power tools is not allowed. OSHA revised asbestos standards (1994) note that intact resilient floor covering materials can be removed under a "negative exposure assessment" in compliance with the revised standards by appropriately trained workers using the "Recommended Work Practices". Intact means that the asbestos-containing material has not been crumbled, ground, sanded, pulverized etc. such that the asbestos particle is no longer bound in the original matrix of binders and materials. Resilient flooring are considered non-friable if they are intact and generally do not admit airborne fibers unless subjected to the sort of aggressive procedures we list just above. Watch out: the work practices refer to pre-1978 buildings, but we frequently report the presence asbestos-containing resilient flooring in buildings built after that date and extending at least to the early 1980's. In some instances it appears that new-old-stock asbestos-containing flooring was installed in the several years after manufacturers stopped producing such products. Watch out: for lead based paint on materials that must be disturbed (such as baseboard floor trim) in older buildings where asbestos-containing flooring must be removed. In general, avoid violent demolition, such as using floor sanders, grinders, or floor stripping machines to remove these materials. During demolition or removal, this material should be disturbed as little as possible. Asbestos monitoring may be required before, during, and after demolition and removal of asbestos containing flooring. US EPA asbestos monitoring advice is given below. Consider simply installing a new material atop the old asbestos-containing flooring. Remember that asbestos is not "radioactive" - it does not cause injury or illness simply by being present, encapsulated in a substance or covered-over by a new material. See ADEQUATELY WET ASBESTOS GUIDANCE, EPA340/1-90-019 that asbestos-containing floor tiles are considered non-friable materials but the materials can become friable with age or by grinding, sanding, demolition, etc. A visual re inspection of all ACM should be conducted at regular intervals as part of the O&M program to help ensure that any ACM damage or deterioration will be detected and corrective action taken. EPA's ASBESTOS REGULATIONS FOR SCHOOLS (the Asbestos Hazard Emergency Response Act, "AHERA") [PDF] (96 pp, 589k), web search 08/17/2010, original source: http://www.epa.gov/asbestos/pubs/2003pt763.pdf, require that an accredited inspector re inspect school buildings at least once every three years to reassess the condition of ACM. While only school buildings are required to have surveillance checks every six months, it is a good practice for other buildings with ACM. The asbestos program manager (APM) should establish appropriate surveillance and re inspection intervals, based on consultation with the building owner and any other qualified professionals involved in the O&M program. EPA recommends a visual and physical evaluation of ACM during the re inspections to note the ACM's current condition and physical characteristics. Through this re inspection, it is possible to determine both the relative degree of damage and assess the likelihood of future fiber release. Maintenance of a set of visual records (photos or video) of the ACM over time can be of great value during re inspections. EPA recommends a visual and physical evaluation of ACM during the re inspections to note the ACM's current condition and physical characteristics. As part of an O&M program, a carefully designed air monitoring program to detect airborne asbestos fibers in the building may provide useful supplemental information when conducted along with a comprehensive visual and physical ACM inspection and re inspection program. For employees who are, or may reasonably be expected to be exposed to airborne concentrations of asbestos fibers above the permissible limits set by the Occupational Safety and Health Administration (OSHA), regulations require that the employer conduct both initial and periodic air sampling. If the ACM is currently in good condition, increases in airborne asbestos fiber levels at some later time may provide an early warning of deterioration or disturbance of the material. This air monitoring should supplement, not replace, physical and visual inspection. Visual inspection can recognize situations and anticipate future exposure (e.g., worsening water damage), whereas air monitoring can only detect a problem after it has occurred, and fibers have been released. The most accurate and preferred method of analysis of air samples collected under an O&M program requires the use of transmission electron microscopy (TEM). Phase contrast microscopy (PCM), which is commonly used for personal air sample analysis and as a screening tool for area air monitoring, cannot distinguish between asbestos fibers and other kinds of fibers which may be present in the air. PCM analysis also cannot detect thin asbestos fibers, and does not count short fibers. TEM analysis is more expensive than PCM analysis. However, the more accurate information on actual levels of airborne asbestos fibers that can be derived from TEM should be more beneficial to the building owner who elects to use supplemental air monitoring in the asbestos management program. TEM analysis is most reliably performed by laboratories accredited by the National Institute of Standards and Technology and who follow EPA’s quality assurance guidelines. (See References, U.S. EPA, Dec. 1989, Transmission Electron Microscopy Asbestos Laboratories: Quality Assurance Guidelines. Washington, DC: EPA 560/5-90-002). Selection of a reliable and experienced air monitoring firm and analytical laboratory is important, if the building owner elects to conduct supplemental air monitoring under the O&M program. A consultant knowledgeable in air sampling and analysis protocols can be contacted for recommendations if the building owner or APM has limited knowledge in this area. See this ASBESTOS TESTING LAB LIST or contact your state asbestos regulatory agency (5 pp, 17k,) for information on how to find an accredited asbestos professional. In addition, the National Institute for Standards and Technology (NIST) maintains a listing of accredited asbestos laboratories under the National Voluntary Laboratory Accreditation Program (NVLAP). You may call NIST at (301) 975-4016. Reader Question: does this floor I'm demolishing contain asbestos? Jared, no one can say for sure what a material contains from just a photo, but the image indeed looks like a 1960's vintage asphalt or vinyl asbestos floor installation, possibly a Kentile floor as those used many pattern inserts. Watch out: it looks as if the breakup is making a dusty mess - something to be avoided in any case. Else it makes sense to treat the material as "presumed asbestos containing" or "PACM" flooring based on age and appearance. Continue reading at ASBESTOS REMOVAL, WETTING GUIDE or select a topic from closely-related articles below, or see our complete INDEX to RELATED ARTICLES below. ASBESTOS FLOORING REMOVAL GUIDE at InspectApedia.com - online encyclopedia of building & environmental inspection, testing, diagnosis, repair, & problem prevention advice. Questions & Answers on procedures for removing asbestos-containing floor tiles or other floor coverings, or on the use of floor rejuvenators and restorative sealants on vinyl-asbestos floor tiles. National Institute of Standards and Technology, NIST is a non-regulatory federal agency within the U.S. Department of Commerce whose lab program is at http://ts.nist.gov/Standards/Accreditation/index.cfm.